SMEs interested in benchmarking their innovation performance should evaluate the IMP3rove Assessment methodology. The IMP3rove methodology is particularly useful if SMEs want to adopt innovation as a strategy but don’t have a structured framework to decide where to make investments when resources are tightly constrained. 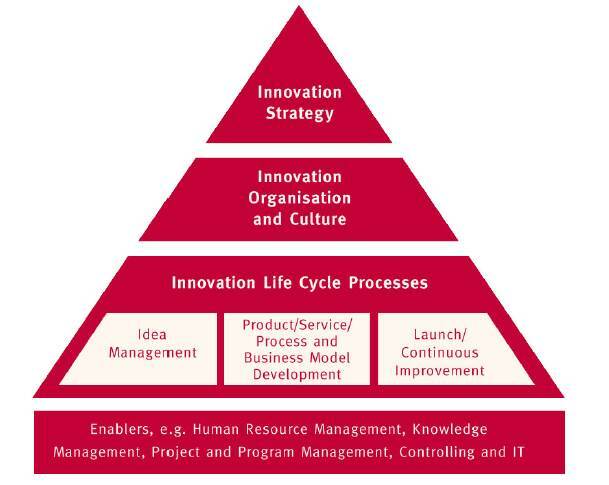 The IMP3rove Assessment methodology uses an innovation model based on the A.T. Kearney ‘House of Innovation’ as illustrated below. Interested SMEs can either perform an un-assisted or assisted innovation assessment. The un-assisted assessment uses an on-line tool. An assisted assessment is supported by a certified consultant who can provide a validated assessment report and improvement opportunities to deliver results. The assessment is benchmarked against a growing database of SMEs in a variety of industry sectors. A key benefit of this approach is the direct applicability of the IMP3rove assessment results to SMEs because it is targeting SMEs and quite a few SMEs have participated in this survey already. In the absence of a mature innovation management approach innovation benchmarking can be susceptible to unrealistic or ideal models of innovation that will just leave SME management frustrated. A minor down side of IMP3rove is that it is tied to one form of innovation model where others exist such as Scott Anthony’s Growth Factory innovation model but this model is optimized for large corporations who have the budget for big innovation investments. SME innovation is relevant today because of slow economic growth and high unemployment in developed countries. SMEs drive growth and job creation more than large corporations. SMEs should therefore evaluate if IMP3rove meets their needs if they adopt innovation as a strategy. This entry was posted in SME Innovation on May 24, 2013 by Andrew Reif.